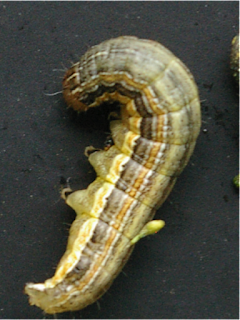 A true armyworm infestation at a treatment threshold level was reported in corn yesterday. In addition, there have been several comments about slugs in corn and soybeans. The common variable in these infestations appears to be winter rye cover crops. True armyworm populations are typically variable because migration patterns are unpredictable. They migrate from the south each spring, like cutworms, since they cannot overwinter in Minnesota. They tend to be more abundant in cool, wet years. Armyworm moths favor areas of dense grass for egg-laying, so grassy field edges, weedy areas, and fields with a rye cover crop should be checked for the larvae. This is may be a minor issue in 2017, but corn and cereal grain crops should be scouted. At this time, the larvae are still small, but large enough to create leaf feeding symptoms on corn or be detected with sweep nets. Slug populations are also often variable. They too are favored by cool, cloudy, and rainy weather. For slug information see http://ohioline.osu.edu/factsheet/ENT-20. The drier weather in the forecast should help with this slimy pestilence. Heat would help as well. For additional information on true armyworm, see https://swroc.cfans.umn.edu/ipm-stuff-2017-true-armyworm.